This is a great HP LaserJet 500 printer. We have had it in our office for about 6 weeks. The pull out keyboard is nice for the scan or email feature. It makes email address entry a little easier than the touchscreen. It is pretty quiet, I was pleased with that as my only issue with another HP enterprise machine we have is it is a bit loud HP Laserjet Enterprise 600. Really the only issue with the machine itself is that it is tall. If I could, I would probably put it on a lower table. It is on a desk height table right now and I wish it were about 6" lower. That puts the top of the machine at 4'6" above ground. The 6'+ tall guys in the office have no problem seeing the top. The 5'4" and under folks, struggle to see the little reminder picture of how to load the document feeder. We ended up putting a little sticker on it reminding people how to load it. It does what we need it to do quite capably. Faxes, copies, scans and allows you to scan to email which is sweet I no longer have to walk everyone through how to scan. Quality on prints are very good. Oddly, quality on copies are very good but quality on scan is just okay (even with boosting the resolution). I don't know how those two functions differ, but they must use some different mechanism because the scan is nowhere near the quality of the copy. Looks more like a fax, so maybe it uses the fax engine. These HP Laserjet Enterprise 500 level machines seem to be "easy peasy" when it comes to using them. It is pretty bulletproof about remembering what type of paper is in what spot (we just use the single tray and the pull down slot). You can set up printer profiles on your machine for three hole punch or color or whatever if the paper isn't loaded in the machine, it will display a message and when you go to pick up your printing, you'll put the right paper in and boom! printing done right. I guess what I am saying is that it seems like we waste far less paper with these machines than we do with other kinds of printers. The only time we waste paper is from a user telling the machine the wrong kind of paper was loaded. The HP LaserJet 500 M525C does kind of "hang" a little between pages on printing multi-page spreadsheets. It seems every printer we have does this to some extent and it is always on Excel spreadsheets that are large. Makes me think it might be an Excel thing over a printer thing. On all documents, the first page is a tiny bit slow, but not awful. Maybe 20 seconds or so. After that it seems to spit the pages out pretty quickly. We are still working on our original toner and we print a fair amount probably average about 300-400 pages per day. About 8 people use this machine regularly and another 8 have access to it. Both this and the other enterprise level HP we have seem to be very economical when it comes to printing costs the toner is expensive but we get a lot out of them. Before this we were using a smaller Brother machine and were changing the cheaper toner cartridge every 10 days or so. 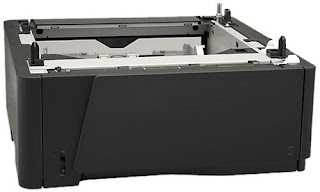 In the long run, the HP LaserJet 500 M525C is just cheaper to maintain. Much more expensive to buy the machine but after trying to use an undersized machine for our printing, this thing feels oddly like a good value (toner lasts a long time and we don't waste prints. The tray installed easily and was instantly noticed by the printer. I t was also very light notlike the printer. this added 500 extra sheets to the capacity of HP LaserJet Enterprise 500. realized that the extra tray would make the printer more useful. Not that the tray is added I can have both 11"x17" and 8.5"x11" paper loaded into the printer at the same time. It's nice to be able to load an entire ream of paper at once. Why this HP LaserJet 500 Sheet printer wasn't designed that way to begin with is beyond me. Installation took only a couple minutes, the included instructions are completely wordless, just follow the pictures. To summarize: unpack, set the printer on top of the tray, add paper, print. The tray becomes "tray 3" and becomes the default paper tray, to use the others you have to specify them through the print menu. 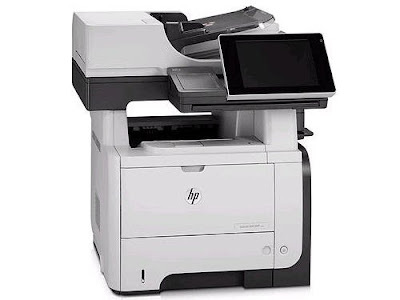 Used with HP LaserJet Pro 400 series. Set the printer on top (After removing I don't know how many piece of protective tape), make any required changes (such as use default or specify paper size, quality, etc.) and away you go. Works with the LaserJets automatic paper selection without any problems.